DVD Synopsis: Join the legendary hero Indiana Jones (Harrison Ford) in one of the greatest screen adventures of all time now on DVD. Accompanied by his feisty, independent ex-flame Marion Ravenwood (Karen Allen), the two-fisted archaeologist embarks on a thrilling quest to locate the mystical Ark of the Covenant. Indy must discover the Ark before the Nazis do, and he has to survive poison, traps, snakes and treachery to do so. Explore the darkest jungles of South America, the bustling marketplaces of Cairo, and a top-secret submarine base with Indiana Jones as your guide to adventure. It was June of 1981, my brother's 10th birthday, and a group of us decided to celebrate it at the movies. After some minor debate, the film we settled on was Dragonslayer, a sword and sorcery adventure many of us were dying to see. We piled into my father's car and spent the entire trip to the theater talking about how great Dragonslayer was going to be. As my father pulled up to the theater, he looked at the huge marquee hanging out front and muttered something underneath his breath, which then caused the rest of us to look as well, and what we didn't see was Dragonslayer in big, bold letters on the marquee. We were at the wrong theater. Sensing my father's desperation to get us out of his car as quickly as possible (I guess we were kinda loud), I begrudgingly suggested that we change our plans and instead see the movie that was playing at this theater, which happened to be Raiders of the Lost Ark. None of us knew much about it. In fact, all I'd seen was a 15-second commercial on TV, in which a giant boulder rolled down a hill. After some more debate, and even a few tears, the others reluctantly agreed. So into the theater we went, somewhat sullenly, with no idea what was in store for us. 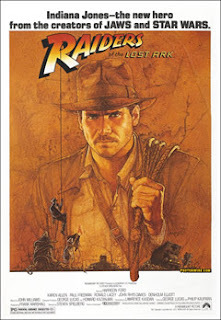 Looking back now, I admit I would have loved to see the expression on our faces when Raiders of the Lost Ark began. The entire opening sequence, where Indiana Jones makes his way through the jungles of South America in search of a lost idol, held our undivided attention. I don't think we so much as blinked. I know I didn't. Never before had I seen anything so exciting, so perfectly engrossing on the big screen. It was more than a great opening to a classic adventure film; it was the moment I fell in love with the movies, and I've been hooked ever since. Simply put, it's because of Raiders of the Lost Ark and the effect it had on me that I'm undertaking this challenge of mine. Hot damn. I had almost the exact same reaction to this movie when I was 13 and saw it in the theater for the first time. I couldn't believe that someone had created a movie that amazing, that tapped in to what I would have wanted to see. Raiders was a transformative event for me. Like you, it's a major reason why I watch films as obsessively as I do now, and why I love them the way I do. Steve: Thanks for the comment! Yeah, this film was pretty much the epitome of excitement for me. I was staggered by how engaging it was, how completely it held my attention. It was the one that showed me how powerful movies could be. I'm guessing you and I aren't alone in sharing this experience with this film! Since we appear to be about the same age (13 or so when it came out) I too was astounded that one movie could have so much action. I remember telling my dad on the way out of the theater that it felt like a ride at Disneyland...then some years later they actually built one of the same name. @Sweetjimmyc: Thanks for stopping by. A "ride at Disneyland" is the perfect description of the effect RAIDERS had on kids back then (at least in our cases, anyway). It was such an exhilarating experience, one I will never forget. Thanks again for stopping by, and for the comment. I was in college. They talked me into going to see the movie because it was a double feature with Outland (sci-fi). Most action movies of the time sucked, in my opinion, but hey, it was a good value for the money and I figured I'd like Outland. By the time that big boulder was rolling his way, I was a convert. I was an avid gamer, and this was the sort of crap that happened in the games when you missed a roll... absolutely fantastic, marvelous film, good female lead as well. Wonderful. Sarah: Thanks for stopping by, and for the comment. RAIDERS set the bar high for all adventure films that would follow, most of which would fall short (even the other INDIANA JONES films didn't quite reach these heights, IMHO). And though she's rarely discussed, I absolutely agree with you: Karen Allen was excellent. Just out of curiosity, what did you think of OUTLAND? @Bilda: Thanks so much. Glad you enjoyed it!